Enjoy skiing in/out of this 4000 square foot home from the Silver Star Lift located at the base of beautiful Park City Mountain. Brand new to the rental market, this quality built home has many custom features and is beautifully and comfortably furnished. It is one of the few New homes on Park City Mountain featuring true ski in/ski out. 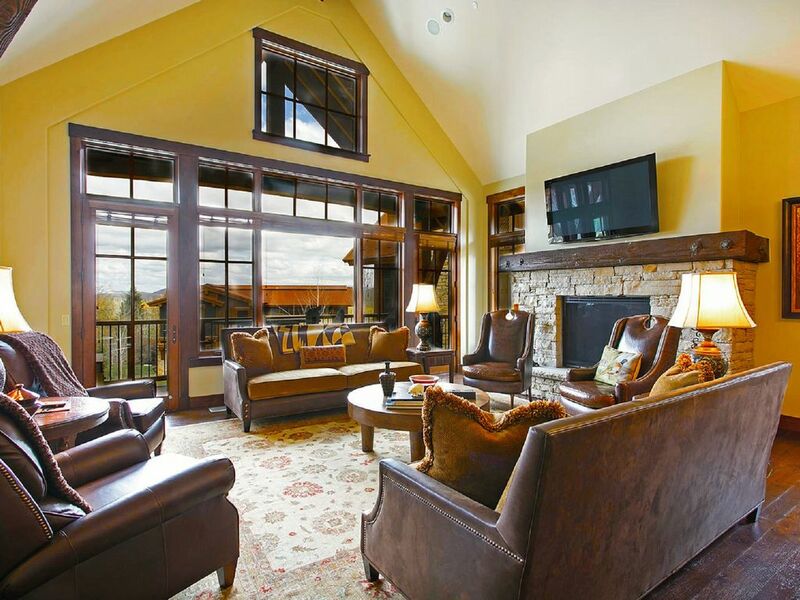 This home can provide your family with the Ultimate Park City Vacation! This multi-level home provides spacious areas to be together with family and friends as well as many areas that offer privacy to get away to rest and relax! The Master Suite is on a separate level. It has a king bed, beautiful natural stone gas fireplace, large flat screen TV/DVD, private bath with a separate Jacuzzi tub and shower, separate vanity areas. Outside of the Master Suite is located an eight person spa on a private patio. Direct TV in all bedrooms, living and family room. The Guest Suite has a king bed, flat screen TV/DVD, private bath with separate Jacuzzi tub and shower. The upper guest bedroom has a queen bed, flat screen TV/DVD and a private bath with jacuzzi tub. This is a lovely bedroom with great views of the mountain and the stars at night. The lower level bedroom/bunk room has 4 full size beds, a private bath, walk-in closet and a flat screen TV/DVD. Also located on the lower level is a large family/media room. This great room has a wet bar with a beverage center, 60' flat screen TV/DVD, a large, comfy sectional sofa and chaise lounger. You will also find on this level an additional half bath and spacious mudroom area with lots of hooks for all of your skiing and sports apparel. The upstairs living/dining room is beautifully furnished, has a beautiful natural stone gas fireplace, 50' flat screen TV and a balcony. All windows are covered with beautiful wooden blinds, easily opened or closed for privacy or views. Adjoining the living/ dining area is a fully equipped high end kitchen with granite countertops and a bar with additional seating for 4. The kitchen has a Viking range with 4 gas burners and a griddle, microwave and Viking refrigerator/freezer. This beautiful kitchen is large enough for several cooks to share. Also on this level you will find a separate pantry, additional half bath and laundry room. There is a whole home audio/video system located on the lower level. From keypads located in every room you can select from XM Radio to your own Ipod to entertain you. Wireless internet is available throughout the home. Enjoy free local and long distance phone service. There is space in the heated garage for parking as well as storage for ski/snowboards and bikes. The Vaccari family is the original owner of this beautiful Silver Star Cottage. Pat Vaccari personally oversees the care and rental of this home. Beautiful Park City is 30 minutes from Salt Lake City airport which has direct flights from many major cities. This is the closest cottage to the Silver Star funicular, which gives direct access to the mountain. This house is so well kept, we felt like we were in our own home the whole time. Very clean and everything you need on a vacation. Our youngs kids loved the bunk beds. Pat was extremely nice and helpful whenever I had any questions. Would definitely love to stay here again. What a fantastic chalet. We were 2 families with 5 kids and this place was perfect. Right next to the funicular to get on the runs, and just a couple of minutes away from Main Street. The chalet is set up so well. One of the best stocked kitchens we have ever seen in a rental! Beds were really comfortable. Tons of washrooms (including a steam shower), lots of towels and really nice robes. Amazing AV / sonos system in every room. Rooms were pretty much soundproof- couldn’t hear people walking around, and lots of room for everyone to spread out. Pat was so easy to deal with. One of our best chalet rentals. We loved it!! We had a group of 6 and we all really enjoyed this property! Very well maintained and cleaned. Large enough to host a good size group. We enjoyed the large kitchen and the comfy beds. The location is great too - right next to the funicular. Or you can walk a little ways down the street to the bottom of the lift. We also enjoyed the hot tub. It was a perfect way to end our day of skiing. Another great amenity was the free shuttle service into town. Thanks again! Exceeded our expectations. Awesome place to stay! Wonderful experience, close to everything, the house is amazing, owners very responsive. Everything you could ask for and more.